VDI GFX driver is not optimized for SAGA yet. We can expect significant speedups, if people help to tune the driver. IDE Driver is also not tuned yet. Very nice results, esp. regarding high end Ataris such as 040 upgraded Milan or Falcon - in CPU, FPU, 3D it blows the "Atari(STs) mind". An overclocked 68060 at 100MHz plus SuperVidelGFX card is certainly a nice and fast system. Nevertheless the Vampire has no problem to win every benchmark against the overclocked 68060 + SuperVidel. that the 68060+Videl uses handtuned ASM drivers - while VAMP today uses generic untuned drivers in C.
As soon as there are ASM tuned drivers for VAMP/SAGA the benchmarks result will be very clear. Surely, hardware implementation is superior enough. I am glad there is a plan to optimize drivers since FreeMINT distros seems to be quite unoptimized. I have found a 040 optimized kernel e.g. Don't forgot CPU and FPU are stupid tests as superscalar can't be used so it is plus minus link to processor frequency. You have done very nice job, this is quite incredible. Do you plane add some speed up hardware for GFX such memory fill? Right now the limitation is purely the drivers and the software. 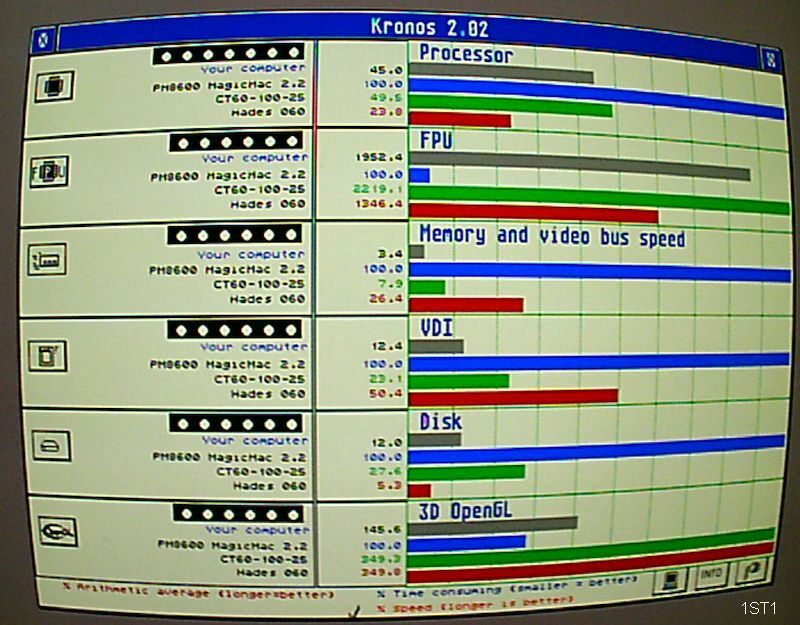 For example KRONOS does some benchmarks on PLANAR mode in ST-RAM. but so far EMUTOS does not use this but use old AMIGA chipset for this. SAGA is about 50-100 times faster than the old AMIGA chipset. So relative small change to EMUTOS /ATARI to use SAGA for PLANAR modes will result in huge speedup. The VDI driver on SAGA is a generic C code. A tuned driver doing the work loop in tuned ASM can for sure double the scores in VDI benchmarks. APOLLO is very fast in memory operations. The CPU can do in Memory fill 700-800 MB/sec. The limit is not the CPU but the driver. Surely Freemint has special compiled kernel for 020, 030, 040,060 cpu. Freemint Version is 1.19 and the Freemint what is used on the vampire is newest compiled with 040 optimizings. I am glad its already 040 optimized. Some speed could be gained with additional 080 compile, when possible. I am glad EmuTOS officially supports Vampire and MINT too ... Nice union. You should get in touch with Thorsten Otto, who is one of the guys in charge of maintaining gcc for Atari plattform. So 68080 optimisation could be implemented. Is this any good compared to other 68K or Coldfire? I think Firebee with Coldfire still has higher bogomips, by price of partial incompatibility. I think everybody agreed already that BogoMips values are basically useless? They more or less just measure how long it takes a certain CPU to do nothing ;). Just for completeness: FireBee BogoMips score is about 265 (probably a slight Kronos rounding/measuring inaccuracy as the FireBee is clocked at 264 MHz). Current average X11 Vamp @80Mhz should rate as 060 100Mhz. Overclocked X12 cores a bit more. Surely, with V4s clock could go to X13 or X15 I hope, as well as more cache, faster RAM and full FPU should contribute a bit. From there, next gen Vampire with bigger FPGA would be needed for more, as in any other case. I still need to learn how to configure Kronos. What results does Firebee score in CPU and FPU chart compared to Falcon? Not really comparable as Kronos is only available as m68k executable. Thus the FireBee has to mill some of the benchmarks through its integrated emulator while others can be executed natively. Kronos is 68K but test are fully coldfire, as tests are inside dynamic library. Ah yes I found the Firebee results. And the test code is indeed Coldfire "native/clean"
Results for firebee are quite old, I'm going to check if they do some progress since, nobody was able to understand why memory access was so low while processor speed is quite fast if run in cache, it was the same when I was using coldfire evaluation board from freescale, perhaps some wrong cache management. 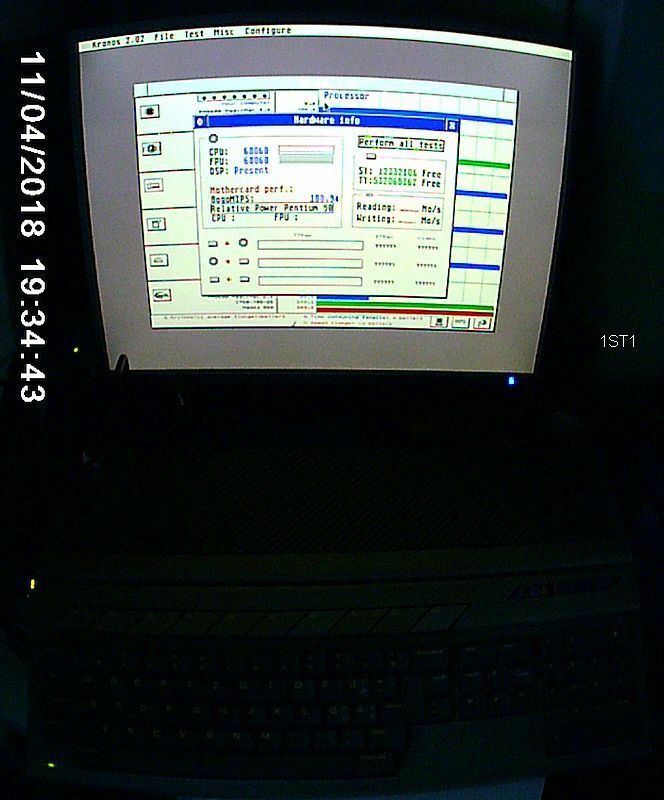 On several 68060 systems results could change a lot with configuration, I know a lot of that have used Kronos on CT60 just to fix the configuration up they was able to acheive reference results!